In the last couple of weeks I often saw questions on OTN JDev & ADF Forum which I answered in a way that the problem can be solved by using a page variable to store the value e.g. 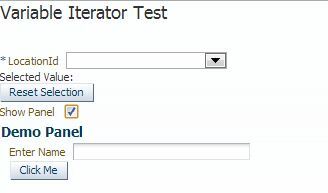 from a dynamic list selection or the status of a check box. Most users don’t use this feature which, or don’t know how to define a page variable. This post show in pictures how to do this. It was mentioned to me that Andrejus Baranovskis did almost exactly a post like this back in 2011 (Page Definition Variables to Store Temporary Page Values). This slipped the search I did, so please take a look at Andrejus Baranovskis’s post too. Page variables are local to the binding container and exist only while the binding container object exists. 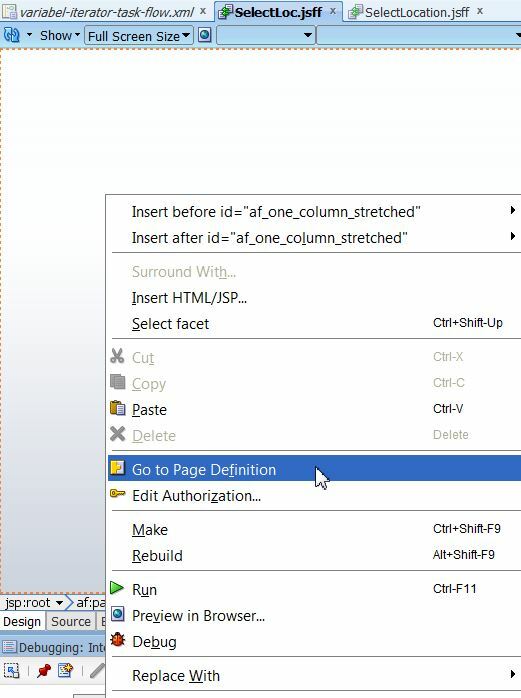 When you use a data control method (or an operation) that requires a parameter that is to be collected from the page, JDeveloper automatically defines a variable for the parameter in the page definition file. Attribute bindings can reference the page variables. A variable iterator can contain one of two types of variables: variable and variableUsage. A variable type variable is a simple value holder, while a variableUsage type variable is a value holder that is related to a view object’s named bind parameter. 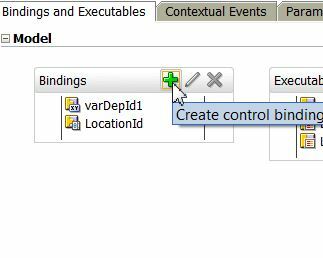 Defining a variable as a variableUsage type allows it to inherit the default value and UI control hints from the view object named bind variable to which it is bound. Now let’s think about a use case where we can make use of the variable iterator. We can e.g. 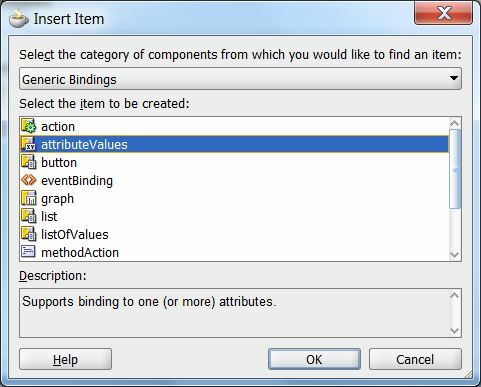 store the selection of a selectOneChoice component in a variable for later use or use a booleanCheckBox to make some other parts of the page visible. OK, let us setup a demo page showing hoe to do this. First we define some variables in the variable iterator. We start with a Boolean variable for the checkBox to hide/show the ‘Demo Panel’. This will create a variable of type Boolean in the bindings of the page. This can be used to store the value of the booleanCheckBox component. 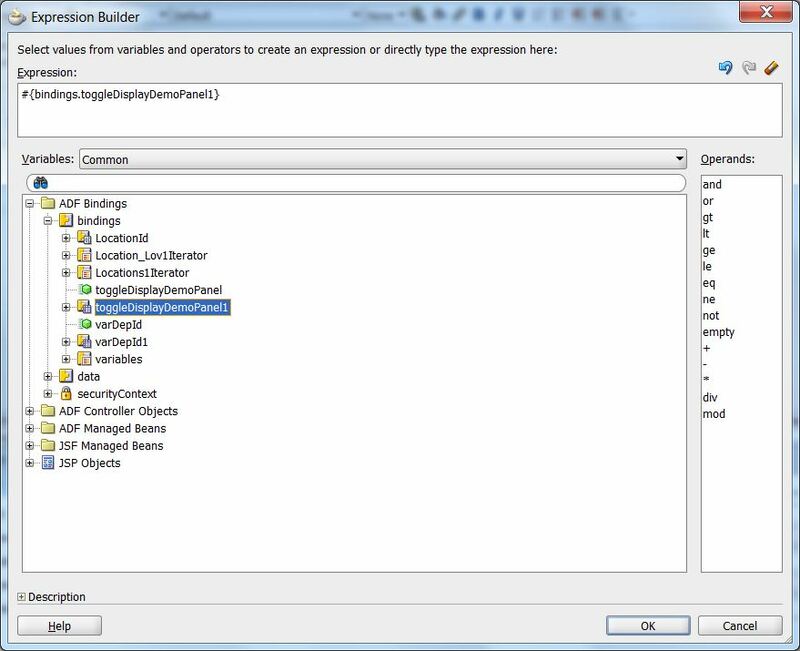 For this select the booleanCheckBox in the page and in the property inspector we use the expression builder to set the value like we do with attributes from the data control. One other thing we can do is to define a variable of type Integer and store the selected value of a selectOneChoice showing a dynamic lov in it. This will be shown below the selectOneChoice component. 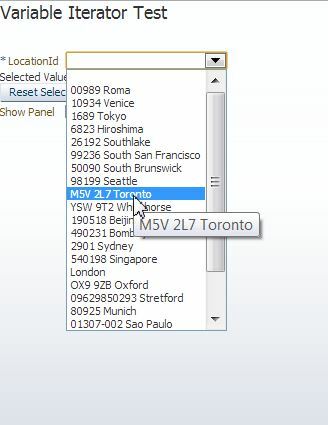 Via a button ‘Reset Selection’ the selection of the selectOneChoice can be cleared by setting the variable back to null. 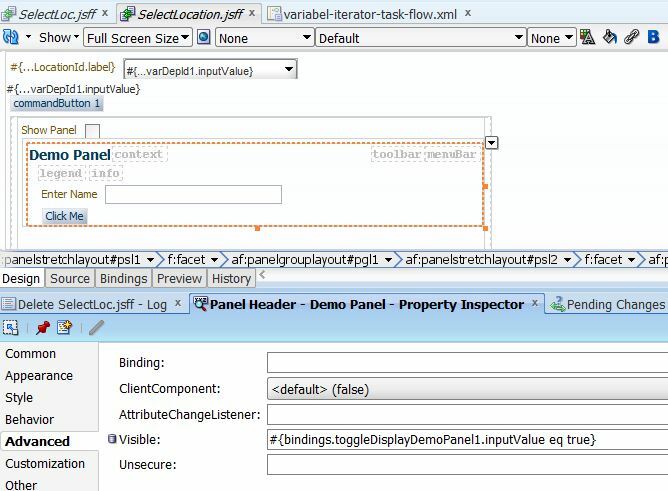 This entry was posted in ADF, ADF Faces, JDeveloper, sample and tagged ADF, adf faces, JDeveloper, pageDef, setPropertyListener, variable iterator by Timo Hahn. Bookmark the permalink. Hi Andrejus, should have know that you already done this. Sorry, this slipped my search and I didn’t remebmer reading it. I’ll ptu a link to your post in hte article! Pingback: Oralution – Oracle ADF – ADF Tutorial: Implementing custom pagination.